Food, bakery, art, crafts, plants, fruit & vegetables, kid’s rides & entertainment. Farm Fresh; Organics; Vegetables; Meat; Seafood; Coffee; Fresh Juices & Smoothies; Live Music & more. 5-13 April @ Manly-Lota RSL Join a wonderful journey celebrating remarkable lives and milestones. Every Sat 7am - Lota foreshore. 5km FREE timed run along the Lota foreshore. the Village. Points earned can be used to enter competitions to win sought after prizes. Since the January launch prizes have included bay cruises, dining vouchers and accommodation experiences. The app offers exclusive deals to users. Free oysters, cheeseboards and coffees are just some of the great deals Manly locals and visitors are already enjoying, just by downloading the app. Start scanning today! Learn, curing and hot smoking salmon and mackerel. Fri 3 May – Workshop Hub @ RQYS Sip and Paint your very own Banksy Street Art. myriad of cafes and bars in Manly Harbour Village. SAILS RESTAURANT at the MANLY HOTEL has a great menu for breakfast, lunch and dinner options. The newest edition to the Manly dining scene - SEA VIBES - has a new restaurant menu and a great takeaway Kids Meal, Seafood Basket and Family pack. Perfect for a picnic on the foreshore. And its TGI Friday 4-6pm with complimentary tapas with a beer or wine purchase. BOOK EARLY for all your Easter and Mother’s Day dining. MANLY HOTEL has added a Pub Choir evening to their extensive entertainment programme. Wanabe pop stars, those who want to blend in with a crowd and everyone in between should head down to the HN Bar for a night of ‘community’ singing and fun. Held on the first Thursday of the month from 7pm - 9pm, with host Kerrie Miles-Dubber. Try the new WORKSHOP HUB activities and spend a few hours relaxing, learning something new or creating your very own masterpiece at one of their Creative, Cooking or Cocktail Making Workshops. All with refreshments included and at the stunning Royal Queensland Yacht Squadron. Unique little boutique stocked with homewares, jewellery, whimsical gifts and resort style clothing. Fresh cold pressed juices, smoothies, acai bowls, coffee & raw treats and healthy eats! Serving up good times, cold drinks on tap, quality pub meals & live entertainment since 1955! Original artwork and gifts. Supporting local artists. Your local art seen! Find a Word BELLA BOTIQO Bella Botiqo stocks mostly Italian linen and silk. Elegant and timeless fashion for every occasion in free sizing. 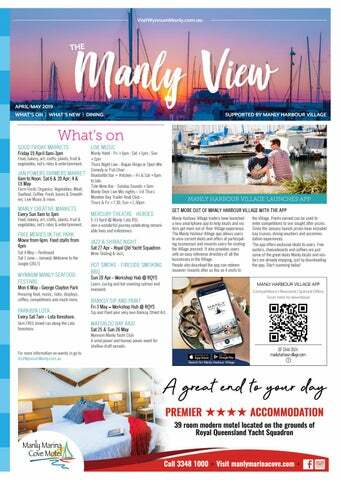 Follow Visit Wynnum Manly on Facebook for more details for Dining, Retail and What’s On. Health & Wellbeing in Manly MANLY HARBOUR VILLAGE is becoming a centre for Wellbeing Services providing for skin care, podiatry and Pilates with massage at MINT MASSAGE and general services at the MANLY MEDICAL CENTRE. Revitalise your skin at SKIN REVOLUTION AUSTRALIA in Cambridge Parade. Check out the new timetable at SANDY CUNEO YOGA at Royal Queensland Yacht Squadron. Variety of fun top quality Workshops, incl Art, Creative, Cooking, Baking & Cocktail Making. All with refreshments at the stunning RQYS location. Boutique florist providing blooms for all occasions; statement plants; bespoke flowers & artisan gifts including scented candles & body products. 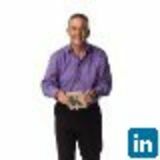 Wondering if Airbnb is a good option for your investment property? Call the experts to find out. Membership, marina, social events, yacht racing, restaurant & bar. Home to Manly Dragon Boat Club. SKIN REVOLUTION AUSTRALIA Cosmetic Injections, Plasma Skin Tightening, Super Hair Removal, Skin Rejuvenation, Laser Tattoo Removal Come in for an appointment or free consultation. We offer various treatments including total relaxation deep tissue and remedial massages in a peaceful and calming environment. Classes, workshops, beginners courses, trainings - for all levels. Mention this advertisement & bring a friend for free to any scheduled class on the current timetable (Valid to June 30). Present this ad for 10% off any treatment or product purchase. (Only with this offer & redeemable once). The Manly View is produced by Leaping Solutions 0408 726 068 | Main Photograph credits by Bayside South Development Forum | Copywriting by Kevin Liepins, Leisha Robertson and advertisers | Typesetting and layout by SteinArt Graphic Design 0408 027 699 | Printing by Harding Colour 3907 6500. Whilst every effort has been made to ensure the accuracy of this publication, the publisher accepts no responsibility for any errors or omissions which may be contained herein. Information on what to do locally, book accommodation and Island tours upcoming events & gift shop. 3 Bedroom short & long term accommodation in the heart of Manly Harbour Village. What's On, What to Do News & Dining in Manly Harbour Village on Brisbane's beautiful bayside.